Sunday was the official start of British summer time (BST), as the clocks went forward one hour at 1am, meaning we all got one hour less in bed but the evenings will be much lighter! 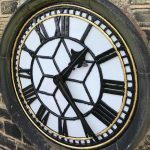 The clocks changing means a busy period for our team, both planning the time change visits and our clockmakers visiting various sites across the UK to complete the changes. Our clockmakers follow a similar schedule each time the clocks changes, including when they go back in the Autumn, so they know their route and clocks well. However, as the number of locations with our PAR-100 equipment increases, the number of clocks which require manually changing decreases. The PAR-100 automatically conducts the time change, and any other time adjustments required, by magnetically holding the ‘pendulum bob’ by magnetics. Timekeeping is governed by an onboard control clock which is fitted with GPS to know when time changes are required. Craig, our resident clockmaker in Scotland, has the longest route which takes him over six days to complete, visiting over 50 sites in the process. This includes a late-night visit to the Balmoral Hotel in Edinburgh, on Saturday evening, to ensure the time is changed at one of Edinburgh’s top tourist attractions as close as possible to the national 1am time change. Left: The Balmoral Hotel Clock. Right: The Bevel Gears within the Balmoral Hotel Clock. 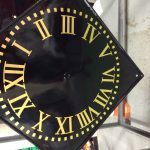 Each mechanical clock requires a different technique to complete the time change. However, is it always easier to complete the change when the clocks go forward one hour, as you should never move a clock hands back. This means that when the time goes back in the Autumn, the clock moves 11hours forward! The team use a number of techniques to change the time on the clock, dependant upon the type of clock and its original manufacturer. On some clocks the clutch mechanism can be undone which releases the hands so they can be turned forward. Another technique used is to release the gravity escapement, this lets the hands spin around for the required length of time, in this instance for one hour.